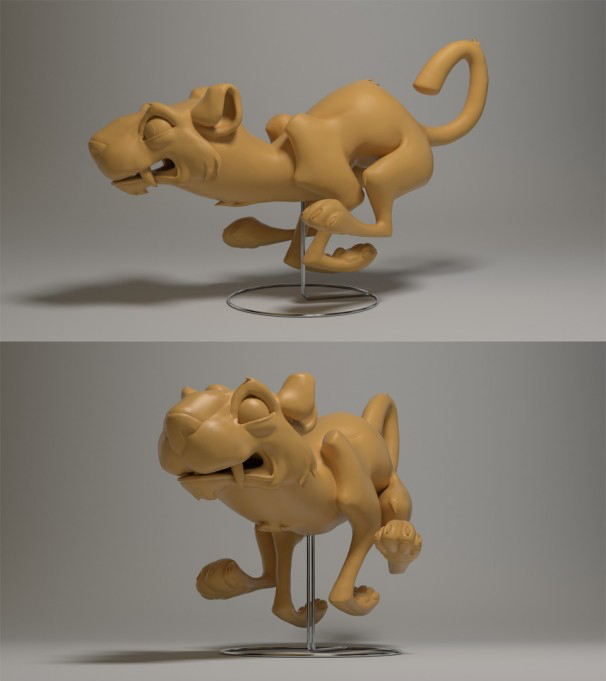 "I’ve been asked over and over again: ‘Why bother sculpting a figurine in clay, making a mold and finally casting a copy of the clay original in resin when you could do it all digitally?’"
We asked our two sculptors, Lisa Schindler (traditional sculpting) and Kent Trammell (Blender) how their two worlds compare. So what are they? Traditional sculpting, considered one of the plastic arts, is the process of shaping a material to create a three-dimensional object. 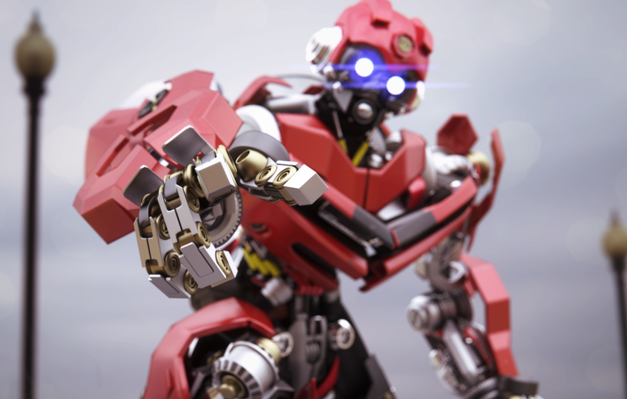 In digital sculpting (or sculpt modeling) we use tools to manipulate digital objects as if they were made of clay or another real-life material. First things First: What are the Starter Costs? Traditional: If you’re looking to get your hands dirty, a few basic tools and one type of clay will cost you $50 to $100. Another $50 will get you a silicone or casting resin in case you want a permanent copy of your sculpture. There are also many tools that you can make yourself for a fraction of the cost of store-bought versions as Lisa often does. 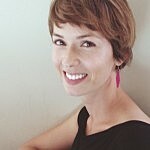 “I’ve been known to use a dental rubber-tip gum massager when I needed a pointed tip with softer impact!,” laughs Lisa. What about taking it further and making sculpting more than a hobby? “A mini-studio with all the tools, equipment, materials and storage space will likely set you back over $1,000,” says Lisa. But that’s not the end of it. “I know I will need to invest in a pressure chamber at some point, which, with a compressor, will probably cost me another $1,000.”Digital: To become a digital sculptor, you will initially need just a computer and the right software. A three-button mouse is enough to get you going, but if you want to continue and grow as a sculptor, you should seriously consider getting a pen and tablet.“I’ve personally never met a professional digital sculptor who doesn’t use a tablet,” says Kent Trammell. “Tablets offer a more intuitive, artistic interaction and pressure sensitivity.” There’s a wide range of tablets available from $29 to $2,299. Kent uses a mid-range budget model: The Intuos Pen & Touch. Traditional: Tools are instruments you use to shape your material. There are two main types of traditional sculpting tools: wooden and metal. “Working with wooden tools feels more gentle, while metal tools tend to produce sharper edges,” explains Lisa. Each type comes in a variety of forms, from pointy and edgy to flat, round or looped. 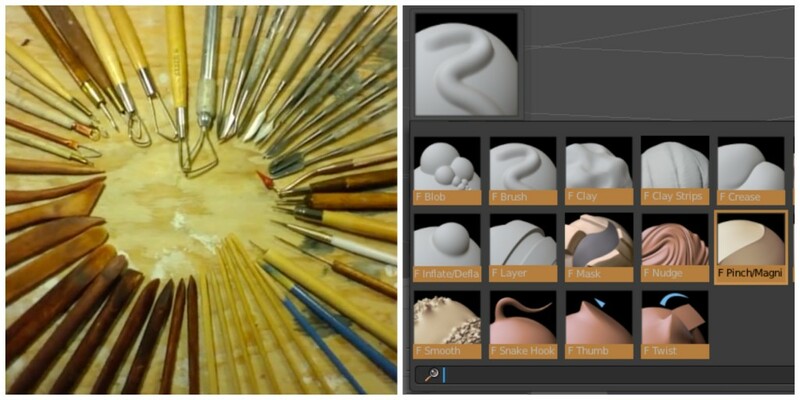 Digital: In digital sculpting, we also use tools, called “brushes”. Just like in traditional sculpting, these brushes shape and form your material. 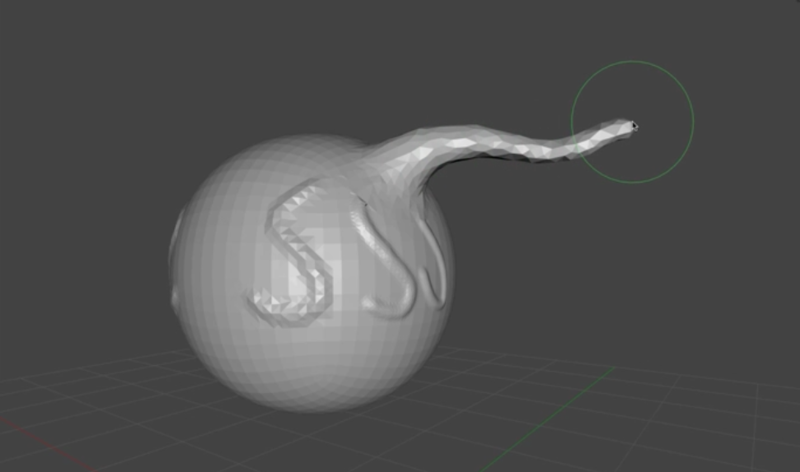 Blender offers various brushes like “blob”, “clay”, “crease” (Kent’s favorite), “inflate” or the essential “mask brush”. Each of them can be controlled for radius and strength, mimicking real-life tools. 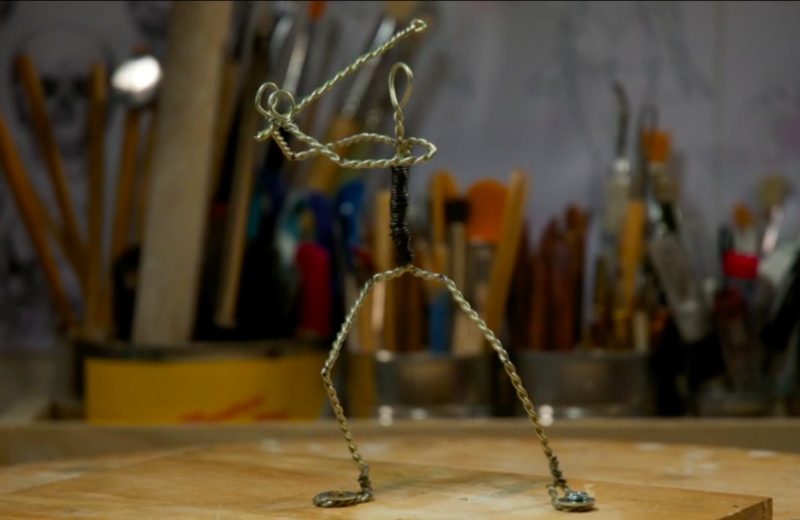 [caption id="attachment_203405" align="alignleft" width="400"] A wire armature[/caption] Traditional: An armature is a structure supporting the weight of your clay and helping it stand upright, functioning as a skeleton. Unlike digital sculpting, the pose of your model is permanent: “I have to decide on a pose before starting to put any clay onto my armature.” says Lisa. “Muscles change their shape with movement, which means once I have a pose I have to stick with it.” Digital: A “rig” is a hierarchical system of bones and constraints that enable a 3D model to be animated. For obvious reasons, they are not needed to make your model stand upright like in traditional sculpting. Isntead, working digitally means you can sculpt your anatomy in a neutral pose, then rig it for easy, non-destructive posing, or make it do cartwheels all over your screen. Traditional: This is yet another step which only exist in traditional sculpting. If you want to make an exact replica of your beautifully sculpted clay garden gnome in a permanent material, you better get moldin’! In a series of steps which involve engineering the right mold and casting your model in it, an intimate knowledge of the different materials is required. “You have a variety of options to choose from, both for molding materials and for casting. 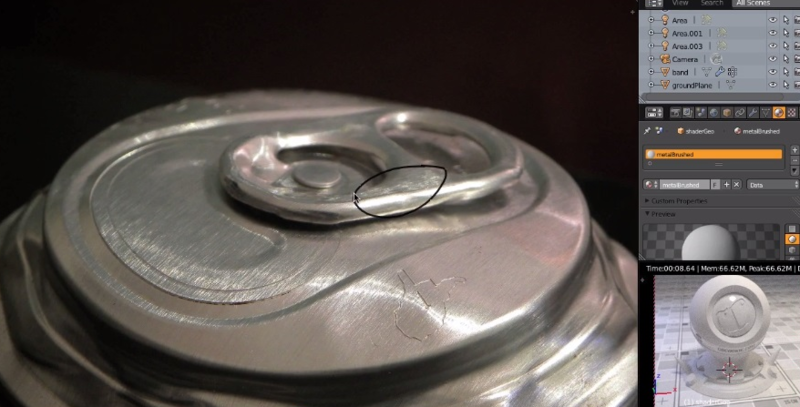 To be a sculptor, you have to become a bit of a materials scientist first,” explains Lisa. Digital: In digital sculpting, none of the above is needed. 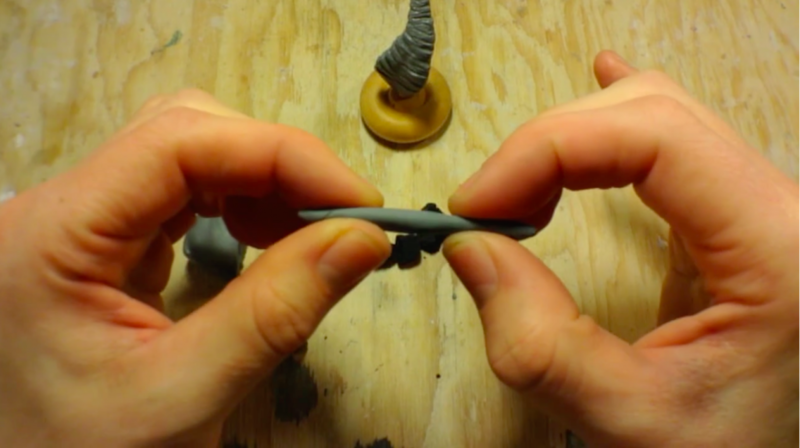 Replicating your sculpt is as easy as copy & pasting your little clone army in seconds. Get Started with Traditional Sculpting Fast: Lisa's "Sculpting Basics"
Learn more about Traditional Sculpting or check out our full offer of Digital Sculpting courses. Thanks Rex, glad you enjoyed it! A very good article. 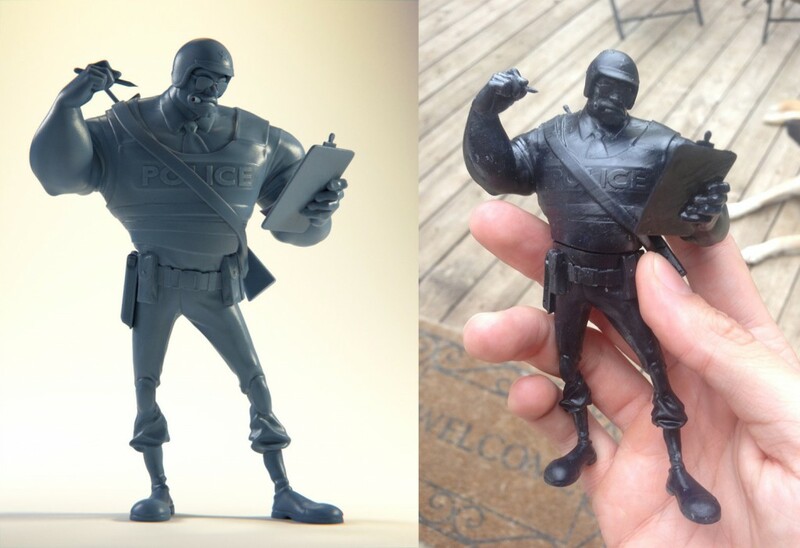 It was interesting to see the comparison between traditional and digital sculpting. For some reason I didn't think about a traditional sculpt as having an armature, but when you think about it, it totally makes sense. An interesting point: with anything but art, the real would beat the digital hands down. Think anything: sports, travel, dating, whatever (maybe except for violence, with which it's the other way around: if you must do it, at least try to keep it strictly virtual). But art is never real: in clay, on paper, or with software, it's only an approximmation of a dream. So if I were to choose, I'd choose what: 1 gives me the closest approximmation; 2 is less dependant on the external factors (like the materials, or my own purely physical skills); and 3 doesn't try my patience so badly that towards the end I start wishing I had swallowed a sleeping pill and never had that stupid dream in the first place. In my case, it's Blender & GIMP all right, but not sculpting: I admire people who have the patience for it, but I'm too much a product of the instant gratification culture. You know, 130 bpm, 60 fps, and 20 kph above the speed limit (just paid yet another fine, damn the speed cameras! :-) ). I have got the chance to read nearly all of your blogs. Thank you so much for your great works that distil such valuable information and share with us. I don't know much effort that I would need to spend on researching these subjects, while I don't have any idea where to start and which questions to ask. Thank you. Thank you for the kind words, that means a lot. I am fortunate to have the extremely talented and knowledgeable CG Cookie crew around who let me pick their brains. So happy to hear that you are enjoying it, I will make sure to keep it up! Thank you so much for the excellent article. Loving both worlds, I observe that there is something special traditional art, especially in sculpture: Its haptical quality. This something which can not be derived from digital art. Its outcome varies with the surrounding light, its surface is influenced by weather, temperature or even contaminants if its set up outside. The viewer can touch it, feel it, and find his preferred perspective. It exists in the real world, its vulnerable to a certain degree and tells about its creator even when the computers are switched off. And in my eyes its the art that lasts over times. This was an interesting read. I've never thought about the two comparisons in such detail before. Thank you.